There are ample opportunities for ophthalmologists to get involved with public policy. Local level: Getting to know your own state representatives and senators when they are in their home district offices is an excellent way to speak about what your patients' concerns are. Attend a fundraiser or make an appointment to meet him or her. Encourage your patients to do the same. Click here to find out who represents you in the Texas Legislature. 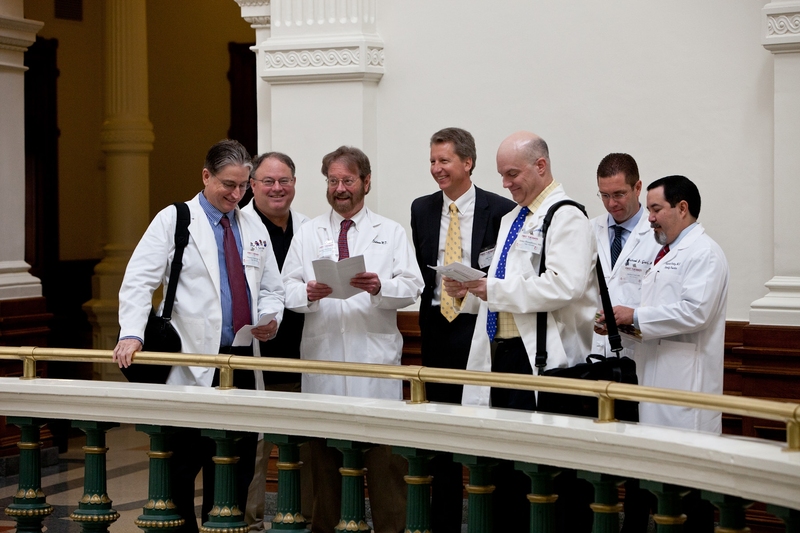 State Level: TOA members join Texas Medical Association's "white coat invasion" every First Tuesday during the Texas Legislative Session. As needed, TOA organizes ophthalmology-specific group visits. You are always welcome to make an appointment with your Representative or Senator during the session - let TOA know you are coming and someone from our staff will join you. Remember - issues such as scope of practice and Medicaid implementation are handled on the state level. EYE-PAC: TOA's political action committee supports candidates who understand the importance of medical and surgical eye care. Your contribution to EYE PAC helps ophthalmology (a small specialty) amplify its voice with candidates. Federal Level: Consider joining your AAO colleagues at Congressional Advocacy Day each April in Washington DC. This is the easiest way for you to meet with your own member(s) of Congress, along with other ophthalmologists from the same district. TOA sponsors 8 residents/fellows to travel to DC each spring to Congressional Advocacy Day. We're in it Together: TOA is a member of the Coalition for Patient Safety (CPS), which is composed of other statewide specialty societies in Texas. The purpose of the CPS is to educate members of the Texas Legislature about dangerous scope of practice expansion efforts.